It’s hard to believe that the 80’s are thirty years in the past! As it is, are you curious what Hilton Head Island was like in the 70’s and 80’s? This can even be applied to you! When did you first start vacationing on the island? How has the area changed from when you first started coming to Hilton Head on vacation? Today we have an interview with Ned McNair, a longtime islander who walks the beaches every morning and has had a front row view of the changes over the years to the area. The breathtaking photograph accompanying the blog was taken by Ned during one of his many beach walks, armed with his camera. You can see more of his beach photograhy on the Hilton Head 360 Facebook page. Joy: Hi Ned, thank you for speaking with me today about Hilton Head Island in the 70’s and 80’s. Can you start by telling me a little about yourself? Ned: Thank you for having me Joy. Judy and I live in North Forest Beach now and have one daughter married to Chris Crowe and are the source of our two grandchildren, one at Clemson and one a senior at Hilton Head Christian Academy. Joy: When did you move to the area? Ned: We moved here in 1971. I use to joke that we helped Charles Fraser chase the Indians off but I have come to the realization that, that is a totally bad joke. Me: What brought you to Hilton Head Island? Ned: I moved here for a job with The Sea Pines Company, the parent company of Sea Pines Plantation, Amelia Island, Florida, Kiawah Plantation and many other projects all over the south and even in the Caribbean. Joy: What is one thing that you loved being able to do on Hilton Head that you no longer are able to do due to change on the island? Ned: When we moved here the entire island was available to every one, all the land, all the creeks, all the woods and all the oyster beds. Those of us here early were like the native islanders, we had it all. Now the best views, swimming holes, fishing drops and paths to the sea are private home sites, golf courses and other private enterprises behind gates. Joy: What is one activity (or thing you love) that you loved when you first moved to the area that you still can enjoy on Hilton Head Island? Ned: The beach is everyone’s as is Calibogue Sound, Broad Creek and Skull Creek if you have a boat or access to one. I also love oyster roasts in the fall and winter. The Island and the Lowcountry are magic and thankfully we are taking care of it in a way that hangs onto the best of the best. Joy: What would you like to see stay as much the same as is possible on Hilton Head that you fear is changing or will change in the coming years? Ned: The landscape here was wild, natural and rural when we arrived. The more we refine the look the more we lose why people love this place, the wild and natural is the thing that draws our hearts here. Me: Can you tell me a favorite memory about raising children on Hilton Head Island? Ned: My daughter would be better at answering this, about 10 years ago she knew I was thinking about buying a boat. She urged me on by saying, “Dad, you raised me on boats and I want that for my children”. We ended up with a good one and her kids love it. Joy: What was the most shocking change to come to Hilton Head in the 70’s and 80’s that you recall? Is Hilton Head better for it or worse because of it? Ned: The recession in the early 70’s was a big shock to a much smaller island in those days. It ended the parent company of Sea Pines Plantation and brought a successive run of people to exploit the situation who had no idea what Charles Fraser and others had set in motion here. I feared for the look and feel of the island. That fear is still with me as more and more people come with ideas that worked in other worlds and who do not understand what drew them here in the first place. Joy: If you could bring back one restaurant on Hilton Head that was open during those years but since closed, what would it be? And why? Ned: The original Quarter Deck in Harbour Town or the old Crow’s Nest on the top of the old Hilton Head Inn had great food, great service and amazing views. You knew you were in a wild and wonderful environment overlooking the sea or Calibogue Sound while a thunderstorm lit up the night. Joy: What animal do you remember being prevalent on the island that is now rare to see on a regular basis? Ned: In the 70’s there were lots of wild pigs, so many they ran into cars several times a year, rattle snakes the size of your leg and way too many raccoons. I don’t miss any of them. I do like the deer that still roam the island. I do miss the alligators. There were a lot more back then. Joy: What has become the greatest threat to the local ecosystem since the 70’s and 80’s? What do you think we need to do to stop that? Ned: The greatest threat is new thinking. We need to stick with old thinking. Everyone and most especially the Island government has an idea of what the island should look like. The island looked just great when they got here and they don’t seem to know what natural is. Take the Sea Pines Park on the corner of Pope and New Orleans, it is a hardscape of square architectural features that is suppose to honor the amazing processes begun by Charles Fraser to keep things natural and rural. Joy: Tell me a colorful story (or two) of the island from the 70’s and 80’s. Ned: My favorite is the great bank robbery in the early 70’s. Some bright pennies from Savannah thought it would be a great thing to rob the rich banks on Hilton Head. Their biggest problem, among many others, was that Hilton Head as an institution was broke in the early and middle 70’s due to the recession. They broke into a bank on Pope Avenue before the employees showed up one morning. The first employee to show up, a woman, signaled the next employee through standard procedures developed for just such scenarios and that man called the police before going in to be with her. The bright pennies from Savannah were informed that the vault cannot be opened before banking hours and got really nervous as they realize they would be there a lot longer than planned. They decided to rob the man and woman and make their get-a-way in the woman’s brand new Lincoln. By the time they got through the circle two police cars fell in behind them on 278 what was then a two lane road leading to a rotating bridge over the waterway. The chase ended at the bridge when the Lincoln hit the iron beam, at a high rate of speed that swung out from the railing along the bridge to block traffic from getting on the bridge when it is open. This caused the Lincoln to jump into the air without wheels or drive train and abruptly land like a flounder. The bright pennies piled out with guns drawn as two police cars slid to a stop blocking the thieves on the bridge. Fortunately the thieves realized the futility of their position and surrenders without gunfire. My buddy Wayne Edwards was the first person to be stopped on the highway by the blocking beam and told me word for word about the capture. Joy: What was an ideal date outing with your bride back in the 80’s and 90’s on Hilton Head? Ned: Shagging to the Headliners wherever they were playing. Joy: What is an ideal date outing with your bride now on Hilton Head? Ned: Still would be shagging to the Headliners wherever they are playing. Joy: What is one thing that readers would have a hard time believing was ever true about life on Hilton Head Island? Ned: In the early days people didn’t ask, what did you do, or what do you do, they asked how long you have been here. It was a very egaliterian society where ex-Generals and maintenance men mixed as equals because we were all pioneers. Joy: If you could choose island life in the 70’s and 80’s or island life as Hilton Head Island currently is today – which era of island life would you choose to live in? Ned: I liked it better back then when the island was more rural, more natural and less populated but it is still a wonderful place to live and I love it. Joy: Okay, while we’ve got a long-time resident on the hook answering questions here, let us in on one of your favorite not-yet-discovered places to eat on the island. What is it? Ned: The Sunset Café out at Hilton Head Harbor near the bridge is owned by the Chef who does a great job and the views are totally wonderful, the sun setting over the bridge and a many mile view up the waterway toward Port Royal Sound. Joy: I know you’re an avid photographer of the beach at sunrise. What is it about sunrise that you love so much? What do you enjoy best about photographing the island sunrises? Ned: The sky and the sea are immutable, dynamic and bathed in beauty at sunrise. It feeds my soul. The warrior, poet and sinner David wrote some 3,000 years ago that the heavens proclaim the glory of God. When I am out there it bathes me in that reality. Joy: Any photography advice for novice photographers on vacation who might want to capture the beauty of the island beaches? Ned: Often, thirty minutes before sunrise and thirty minutes after sunset are the best skies. Joy: Well, thank you so much, Ned McNair, for sharing with us a bit about Hilton Head Island in the earlier years. Any last observations or insights you wish to share with my readers about Hilton Head life, then versus now? Ned: Thank you Joy for this opportunity to share my love for this special place. My advice, keep it real. Ned McNair is an old man. 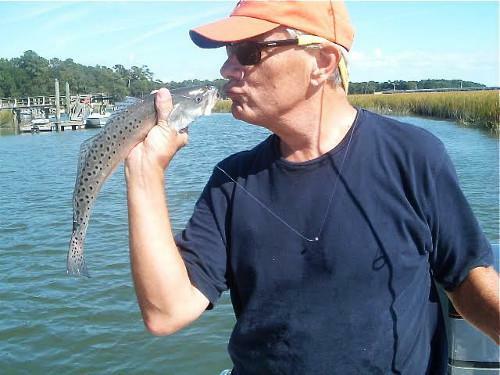 He and his trophy wife, Judy, have lived on Hilton Head Island since 1971. He stumbled out of high school, grew up in the US Navy and moved here to work for The Sea Pines Company. He has owned his own company, fished with his grandson, danced with his granddaughter, drunk bourbon with his Son in law, won a sail boat race with his daughter and loved one woman. He thinks Jesus is behind it all but he isn’t what you would call religious.